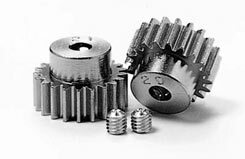 All Products > "50356 Tamiya 20 & 21 Tooth AV Pinion Set"
A set comprising of Tamiya 20 & 21 Tooth AV Pinion Gears. For an even greater acceleration! Best when mounted to the shaft of a 540 motor.